Back in the drears of January, I felt a certain pull to spend more time reading. I assumed it was just because I missed sticking my nose in a good book, but it turns out, God had a whole lot of things to say to me. I've talked here and there about most of these books/resources, but it makes sense to consolidate them here, as part of 31 Days of Going. These are the voices that reeled me in and made me believe harder. They kept me company when it seemed like no one around "got" us. They challenged me to get the flipping lead out and move. So, if you're feeling your pulse quicken a little, if life is throwing you curve-balls and you know things are about to get crazy up in here, if you ache for a broad stroke of wild in your life, pull up a chair. And bring a highlighter. ** I borrow the phrase "heavy influencers" from my pretend BFF, the zany, whip-smart Jen Hatmaker (see above). I'm sure she won't mind. You always make me smile. 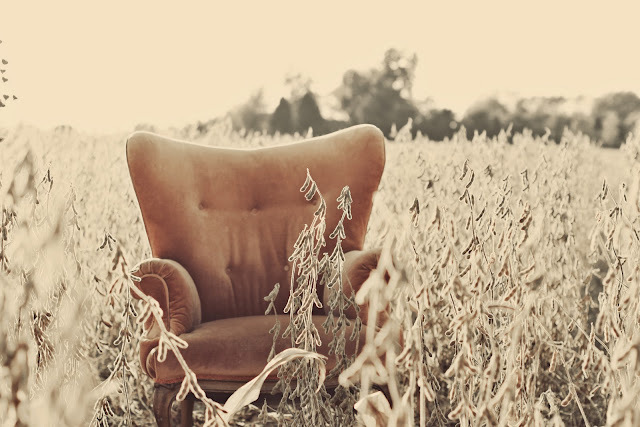 That is a pretty chair and a very pretty field. Thank you for your list. I clicked on the link to "Promises I Can Keep," and that does look so interesting. Love this post and feel beyond honored to be on your list my friend :-) by the way, I have read and loved nearly all these books too -- excited to read the rest! I knew Francis Chan, Shane Claiborne, and David Platt would be on your list! And Leeland, yep. (don't forget Gungor and Beautiful Things...oops that's mine : ) And Hugh Halter is my little brother's friend. I'll be picking up The Gutter, and "The Barefoot Church" I go back and re-read Brennan Manning often. He reminds me who I belong to. I'm excited to read Katie's book and I shall eventually read your bff Jen's book! Is that your chair in the field? It looks like a chair from your house ..no? Thank you for your list. You're right, there's that ache and while there might not be a road map for any of it, I'm excited to pick up some of these sort of flash lights that have helped you find your way. LOVE Brave and Radical. Been reading Ruby Payne for years and go back to her books several times to help remind me and direct me with these kids we are working/living with. Great list! This list came in perfect timing for me. On a very personal note I find myself slipping from a faith I've lived my whole life. There's a constant nagging in my mind of "is this really how it is?". And these books might just be what I need. What I wouldn't give to be in a book club with you, girl. Highlighter, no doubt! And perhaps a big glass of water to help a person choke all that challenging goodness down. From both the lump in your throat & the hard teaching. See lots of my personal favs on your list, and I few that I have in the queue as well. Excited to add a few more now too. "As God incarnate becomes fleshy - 'alive' - to you, you will likewise become more fleshy to the world" p. 39. The lifetime achievement award is hi-larious. And also appropriate. Love your list, in all its chronological glory. The link for your sister's blog goes to Sit a Spell instead. Is it just me? How am I ever going to read all of these at once : ) hahah What an awesome list!!! Can't wait to get started!! Did I see "Almost Amish" on your page a little while ago? I saw it on the side of someone's blog and just picked it up. It looks like a good read as well. You know how to make a girl's day turn right around. Love to you. Kisses From Katie was life changing, and I have Barefoot Church sitting on my shelf, it's next in line! Loving this series. Several of those books are either already on my Kindle or on my wish list at Amazon. I loved "Kisses from Katie"
A decade ago when I was working as an urban planner (dealing with low-income grant programs), my employer sent me to a Ruby Payne seminar - how she changed my way of thinking, absolutely blew my mind. I often think of her when I read your blog --- I was so happy to see that she was on your list!